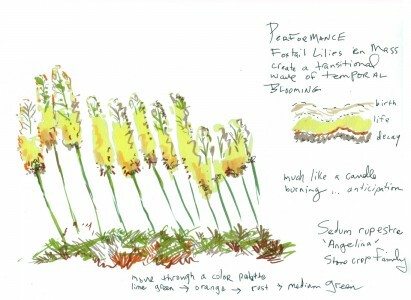 Thinking about the poetic transitional beauty of Foxtail Lilies. I had the opportunity to work around some of these at the Denver Botanic Gardens. I love the architectural beauty of their structure as they wave in the wind. In my mind, Sedum Rupestre “Angelina” is a perfect ground cover for underneath. In the fall, the colors in the sedum reflect the earlier transition of the Foxtail Lilies. And then the lilies sport wonderful podlike beads and remain architectural throughout the fall. I may plant some very soon in a contemporary space that I am designing.